Informative, straightforward answers to common questions. What is BS 102000 and why is it important? In the absence of mandatory regulation (licensing) of the private investigation sector, certification to BS 102000 demonstrates professional integrity, competence, accountability and legal compliance. Surveillance and investigation companies certified to BS 102000 commit to ongoing independent external verification of their compliance therefore assuring customers of the highest standards of quality and service delivery. The first edition (2013) is now superseded by the 2018 edition and has been expanded to include a wider range of investigative sectors other than the private investigation profession, ensuring the Standard remains the core code of practice for investigation services. The EU General Data Protection Regulation (GDPR) is the most important change in data privacy regulation in recent times. It came into force in the UK on 25th May 2018. Designed in response to advances in technology and the methodologies by which data is collected, stored and shared in comparison to 20 years ago (when the DPA was first enacted), the GDPR provides EU citizens with enhanced protection from data breaches and gives them greater control over their privacy. The GDPR applies to all companies and organisations processing the personal data of people residing in the EU; the nature of an organisation’s business and the sector in which it operates makes no difference to that organisation’s obligation to comply with EU data protection law. It also applies to companies and organisations outside the EU if they process data of data subjects within the EU. Crucially it affords individuals more control over their data by allowing them to request that their personal data be erased (also referred to as the ‘right to be forgotten’). This includes requesting social media channels delete information they posted in their childhood and the reliance on default opt-out or pre-selected ‘tick boxes’ to give consent for organisations to collect personal data is no longer acceptable. Who is the National Security Inspectorate and what is the significance of UKAS accreditation? The National Security Inspectorate (NSI) is recognised as the leading certification body for the UK private security industry. NSI certification provides reassurance that companies work to the highest industry standards demanded by the Police, Fire and Rescue Services and the Insurance Industry. The United Kingdom Accreditation Service is the sole national accreditation body recognised by government to assess, against internationally agreed standards, organisations that provide certification. Certification is recognised as being a differentiator as well as demonstrating regulatory compliance, and an increasing number of both public and private sector organisations are specifying certification by a UKAS accredited body. There are many organisations in the UK offering certification, however they do not all have the same level of recognition as UKAS. If their certification body does not have the tick and crown, it is not UKAS accredited. UKAS Accreditation and Certification are central pillars of quality assurance and underpin confidence in service providers. What is the Association of British Investigators? The Association of British Investigators (ABI) is the kite mark of the UK private investigation industry. The ABI campaigns tirelessly for regulation and promotes excellence, integrity and professionalism within the private investigation industry. The ABI is endorsed by The Law Society of England & Wales and is included in the service provider scheme for The Law Society of Scotland. Why do Insurers use surveillance in personal injury cases? Surveillance in personal injury cases is generally used in high value claims where ongoing disability is alleged and an Insurer suspects fraud or exaggeration of symptoms. Surveillance can include covert filming of a claimant engaged in normal lifestyle activities and online interrogation of social media intelligence (SOCMINT) and open source intelligence (OSINT). Insurers often engage the services of surveillance companies to discreetly surveil claimants for the purpose of validating the veracity of their claims; essentially to assist in determining whether a claimant is genuine. The purpose of surveillance in this context is to help ensure genuine claimants are awarded fair payments and to identify those who seek to profit at the expense of honest policyholders, whether through malingering, exaggeration or fraud. Official statistics released by the Association of British Insurers reveal the Industry detected 125,000 dishonest insurance claims valued at £1.3 billion in 2016. Insurers contend they do everything possible to keep premiums down and tackling fraud, which drives up prices for honest policy holders, is a key strategic priority. Insurers acknowledge the majority of personal injury claimants are genuine and millions are paid out every day. Companies and organisations whose data processing activities are not considered high risk are nevertheless encouraged by the Information Commissioner’s Office to use them as ‘best practice’. Is surveillance a breach of my human rights? Providing surveillance evidence is obtained in a public environment and the methods used to obtain it are not unnecessarily intrusive, disproportionate or illegal it does not contravene your human rights. The Act applies to Public Authorities (not insurers or private investigators*) and demands compliance with the Articles of the European Convention on Human Rights. The Act is only enforceable against Public Authorities (not insurers or private investigators*) however, reputable surveillance and investigation companies consider it best practice to adhere to the spirit of the Act and base their business practices and operational standards upon it. The Act sets out our human rights in a series of ‘Articles’, the two most relevant to surveillance being Respect for private and family life, home and correspondence (Article 8) and the Right to a Fair Trial (Article 6). A claimant will cite Article 8 when objecting to surveillance evidence whilst a defendant will counter with Article 6 when seeking to rely on it. The prevailing objective is to ensure justice for all parties and when cases litigate, the Courts ruling is sacrosanct. Is personal injury surveillance legal? The surveillance must be conducted in a public space, defined as any environment to which the public has access by right or invitation, whether on payment or otherwise. There must be a legitimate reason for surveillance; insurers cannot instruct surveillance speculatively in the hope of obtaining useful evidence to undermine a claimant. The surveillance must be lawful, proportionate and can only go as far as is necessary to achieve its objective. Although less common, Insurers also instruct post-settlement surveillance for the purpose of lodging an appeal to reduce or even reverse compensation awards if gross exaggeration or fraud can be proven. What is acceptable filming practice and what is not? Reputable private companies providing surveillance and investigation services will publish strict guidance to staff which will usually include mandatory adherence to a code of conduct based on best practice, such as British Standard 102000 ‘Code of practice for the provision of investigative services’ and the Association of British Insurers ‘Guidelines on the instruction and use of private investigators’. Such codes should also reflect the spirit of the European Convention on Human Rights. PUBLIC VIEW. Claimants undertaking activity on private land when the evidence can be obtained from a public vantage point including claimants in gardens, driveways and in the interior of domestic garages or other outbuildings providing the investigators do not trespass onto private land and the activity inside is on clear public view. PLACE OF EMPLOYMENT (Public). Claimants at their place of employment provided the public has access, on payment or otherwise. PUBLIC ENVIRONMENT. Claimants in an environment where the public has unlimited access, indoors or out, including but not limited to retail outlets, nightclubs, public houses, restaurants, cinemas and leisure centres. All reasonable steps should be taken to avoid filming children. In environments where it is likely children will be present (e.g. schools, leisure centres, swimming pools and playgrounds) filming should not be permitted under any circumstances. RESIDENTIAL PROPERTIES*. Claimants within the confines of their own homes or any residential property, including conservatories and porches. *There have been occasions when private investigators have entered the homes of claimants and obtained covert evidence under the guise of a pretext; Jones v University of Warwick  is one such example. The evidence proved the claimant was exaggerating her symptoms and was therefore ruled admissible. However, although the Court ruled the intrusion was justified it imposed a costs penalty against the Defendant for the morally dubious tactics used by their surveillance agents. PLACE OF EMPLOYMENT (Private). Claimants at their place of employment where public access is prohibited, including office blocks and commercial premises. NHS PREMISES and SURGERIES. Claimants should not be filmed inside NHS premises or surgeries; there is a reasonable expectation of privacy in these environments. PRIVATE LAND. Claimants on private land which is either part of their property or any adjoining property, where film cannot be obtained from an ordinary standing or seated position on a public highway. PLACES of WORSHIP. Claimants attending churches, mosques, synagogues, cemeteries, crematoriums or other sacred land; there is a reasonable expectation of privacy in these environments. STATE OF UNDRESS. A claimant or a juvenile in a state of complete or partial undress (including underwear), irrespective of a public environment, in acknowledgement of the clear moral and ethical considerations. Reputable private companies will promote a culture where legality shares equal status with ethics and morality. It isn’t simply a question of ensuring legal compliance; decency and respect must also be observed in equal measure. Is the use of tracking devices lawful? The ‘use’ of GSM, GPRS or SMS covert surveillance systems (tracking devices), is not illegal however, their ‘deployment’ can be. For example, a surveillance operative who walks onto a domestic driveway under cover of darkness to attach a tracking device to the underside of a claimant’s parked vehicle is trespassing (a common law tort). Consequently many reputable surveillance and investigation companies consider the use of tracking devices intrusive and unethical. I have been served with surveillance evidence. Can I challenge it? You are not alone. The use of surveillance evidence by insurers in higher value personal injury cases is commonplace and you can absolutely challenge it. Often the issue of liability is settled early in a claim cycle but causation and quantum are contentious issues that take longer to reach resolution. It can be upsetting and unnerving to learn you (and sometimes family and friends), have been covertly surveilled. However, a genuine claimant has nothing to fear since whatever activities they have been filmed undertaking will be a true representation of their lifestyle and mobility. There is definite value in objectively viewing and evaluating the surveillance evidence to afford an opportunity to provide context or where appropriate, to challenge its veracity. A thorough evaluation should include access to the unedited surveillance evidence including written or typed logs and records made by the surveillance operatives; the latter are important since they will enable you to cross reference and identify potential discrepancies. In the event concerns arise regarding the authenticity of the evidence or the methods used to obtain it, a video evidence credibility analysis service can provide specialist assistance. What is the difference between ‘edited’ and ‘unedited’ surveillance evidence? The original surveillance evidence (film), should never be edited under any circumstances. It should be copied to provide working copies which should themselves be edited to present events in chronological sequence and when necessary, to pixilate to preserve the anonymity of juveniles or other third party personal data. During the course of a live surveillance operation multiple cameras are often used to gather evidence. Consequently at the conclusion of the operation there can be several SD cards or other digital media containing evidence in fragmented sequences; the editing process simply pulls them together in date and time order for ease of viewing. It is a common misconception that editing involves both the selection and omission of film illustrating a claimant to create a misrepresentation of events in favour of the defendant; it does not, or at least, should not. A surveillance and investigation company is obligated to disclose all evidence which illustrates a claimant and the editing process must be unbiased and impartial. Many reputable companies will have a formal Editing Policy which should be made available to claimants, their legal representatives and other stakeholders upon request. How do you distinguish between a reputable and disreputable surveillance company? The private investigation industry is no different to any other profession; unscrupulous investigators exist and there are inherent dangers in engaging with rogue surveillance companies. It is entirely reasonable that when an insurer has cause to doubt the veracity of a claim there should be a credible process in place to investigate it for validation purposes. The UK insurance industry has engaged the services of surveillance providers to great effect for several decades but nevertheless, care should be exercised when appointing a surveillance company since not all providers supply the same service; modus operandi, competence and morality vary widely. Other useful indicators of a reputable company could include a published Code of Business Ethics and Code of Conduct, both of which should be made available to stakeholders upon request. The camera never lies, right? In the mid-19th Century a photograph was considered a truthful representation of a scene. Camera technology has since evolved exponentially and radically reinvented photography. Cameras are now an accessory of daily life and digital media is accessible to all; anyone can create a film with something as simple as a mobile phone. The expression ‘the camera never lies’ is as unreliable now as it was when first spoken. The simple fact is a camera can be manipulated at will, even without the need to resort to Photoshop or similar editing software. 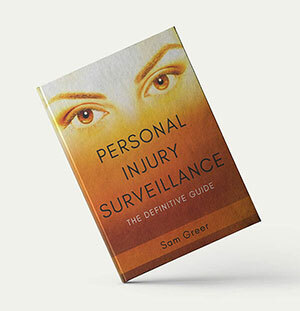 How prevalent is the use of surveillance in large personal injury claims? It is probable insurers instruct surveillance in the vast majority of large personal injury claims but in most cases, choose not to disclose the evidence so the true extent of its use cannot be precisely quantified. When surveillance evidence reveals nothing suspicious but merely serves to illustrate a claimant engaging in activities entirely consistent with their alleged ongoing symptoms and restrictions, insurers have nothing to gain by disclosing it. Claimants and their representatives may never know surveillance has occurred and for this reason we only see the tip of the surveillance iceberg. What is selective filming practice? This is a highly contentious area. Private investigators acting on behalf of Insurers are understandably viewed with extreme suspicion by claimants and their representatives. There is an inherent adversarial backdrop no matter how dispassionate they claim to be. Surveillance is not an exact science. It is rarely possible to film a claimant with unbroken continuity when undertaking surveillance in a public environment; a multitude of dynamic factors influence events in real time and impact an investigator’s ability to obtain film. Consequently challenges arise regarding what has not been captured on camera, rather than what has; so called selective filming practice. It is difficult to prove a negative. Unless a claimant can produce irrefutable evidence that they undertook a specific activity which was not filmed by an investigator during the course of surveillance, then surveillance evidence can be misrepresentative. The integrity of the investigators is crucial.